From the bestselling author of Dirty Little Secrets and Transcendence series comes yet another highly entertaining, suspenseful and supremely readable story! The Third Twin is a murder mystery and high-intensity thriller about identical twin sisters, Alexa and Ava, who play with fire by pretending to have a third sister, Alicia. Alicia is fun, beautiful, fashionable and extremely popular with boys. She goes on many dates, gets invited to all the hot parties and is simply the coolest sister out of the three. The only problem is, Alicia doesn't really exist. She's made up. It's always Ava and Alexa pretending to be Alicia, taking turns going on dates and fooling around with boys. But, as usual in these kind of situations, it's all fun and games until someone gets hurt. When Alicia's boyfriends start dropping dead one by one and the cops come knocking on the door, looking for the third sister who doesn't exist, the girls find themselves in a whole lot of trouble. Someone's out to get them, will they find out who before it's too late? This book was extremely entertaining. It took me back to my high school years when I was obsessively reading R.L. Stine's The Fear Street. Fun, fast-paced and easy to read, this was simply a solid and well-written teen thriller with some elements of family drama and romance. Semi-cautionary tale, designed to scare but also teach the kids not to play with other people's emotions, because, hello, you might get burned. Badly. This is a plot-driven story. The characters are interesting enough to keep the readers engaged and captivated, but they're not particularly memorable. I didn't hate them, but I didn't get especially invested in their fates, either. I did, however, want to find out what in the world was going on. The mystery aspect of the story was supreme and executed with the utmost care for details. I could not for the life of me tell who the evil culprit was. I had tons of theories and I suspected everyone. Well, almost everyone, because I was honestly surprised to find out who was behind the murders. The ending was very twisty and gasp-worthy. I was so sure I had it all figured out, but was taken aback by the final reveal. Omololu did a great job keeping the suspense going and she really managed to surprise me at the end. I am so glad I got a chance to read this book. 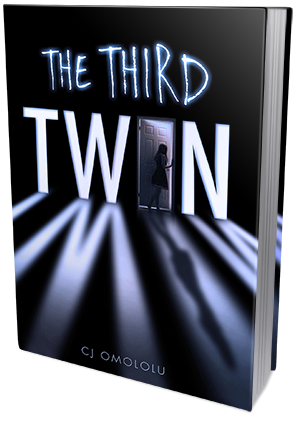 If you enjoy entertaining thrillers that really mess with your head, The Third Twin should be your next read. Particularly if you happen to be a fan of The Fear Street and movies such as I Know What You Did Last Summer or House At The End Of The Street.